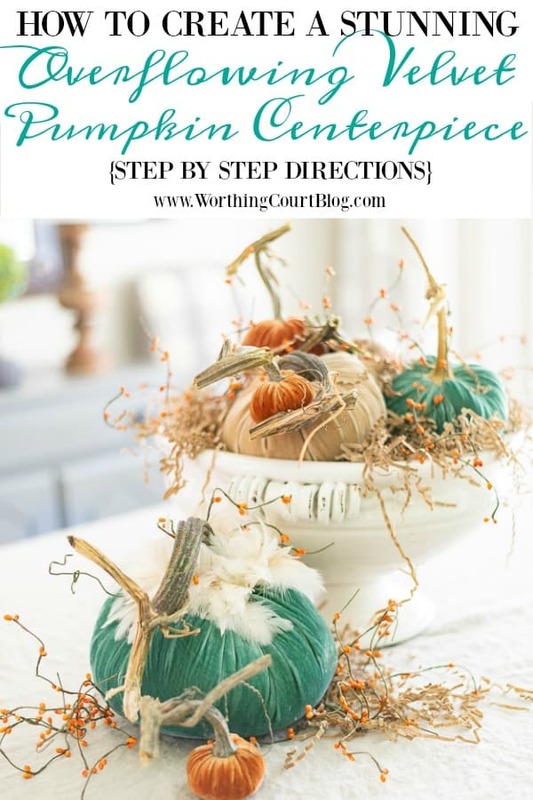 Take your table to a whole new level this fall with step by step directions for creating a luxurious fall centerpiece with Hot Skwash velvet pumpkins from LoveFeast. I was compensated for this post by LoveFeast. The original project, photos and opinions are 100% my own. See my full disclosure HERE. 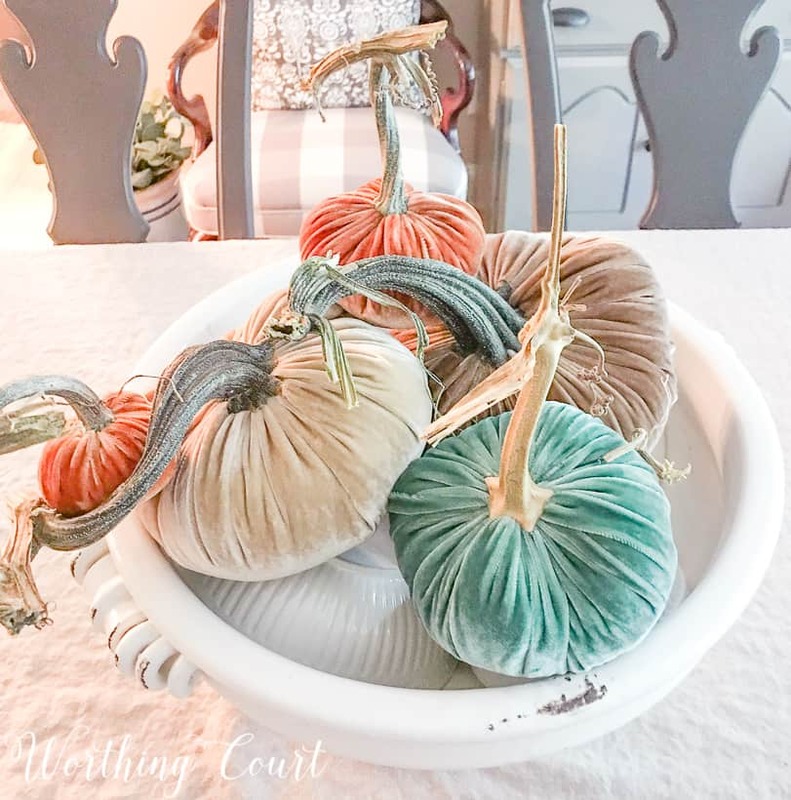 Today, a few of my blogging friends are getting together to celebrate the arrival of fall with glorious Hot Skwash velvet pumpkins from LoveFeast. 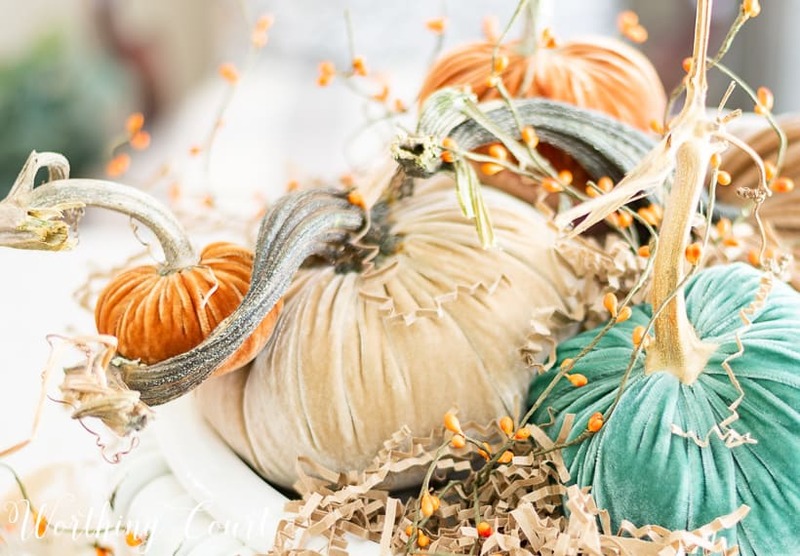 We’ve all put together ideas for how to use these beauties in your home this season. Be sure to visit my friends at the end of this post to see their beautiful ideas too! These Hot Skwash pumpkins are exquisite and are the most beautiful velvet pumpkins that I have ever seen! As soon as I unpacked my shipment, I immediately had a vision of what I would do with them. They are deserving of a special place and would become an elegant fall centerpiece for my dining room table. 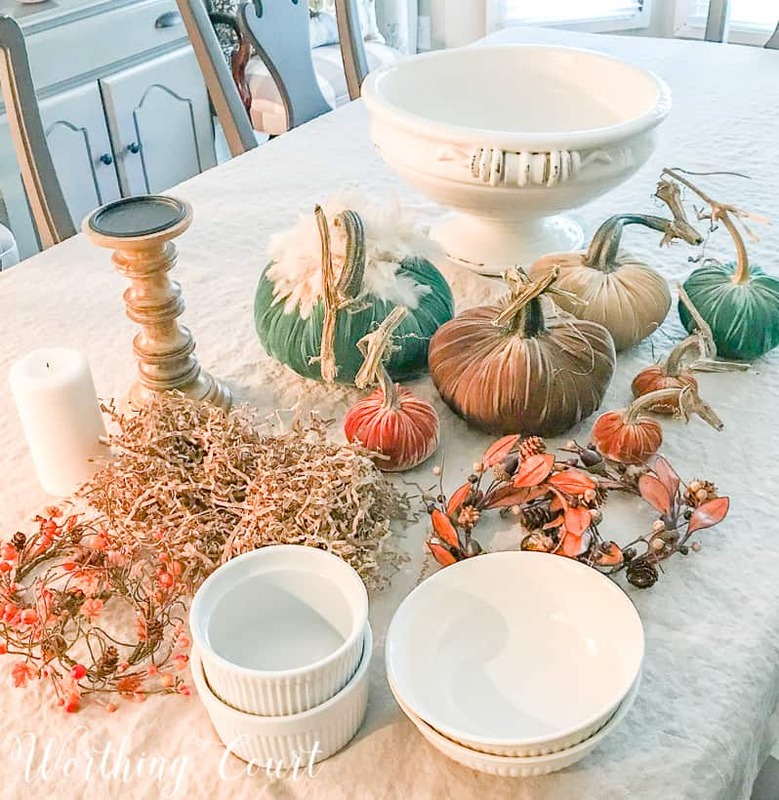 I love the mix of neutral, blue and traditional fall russet mixed together, so to really set the colors off, I grouped them in a large, white footed bowl that I placed on top of a washed natural linen tablecloth. The colors just POP against the neutral background and are gorgeous! Each silk velvet pumpkin has a realistic, lumpy appearance to it and is tightly gathered at the top. They’re firmly packed with crushed hazelnut shells so that they will always hold their shape. One of my favorite things about them are the real pumpkin stems that each pumpkin is topped with. 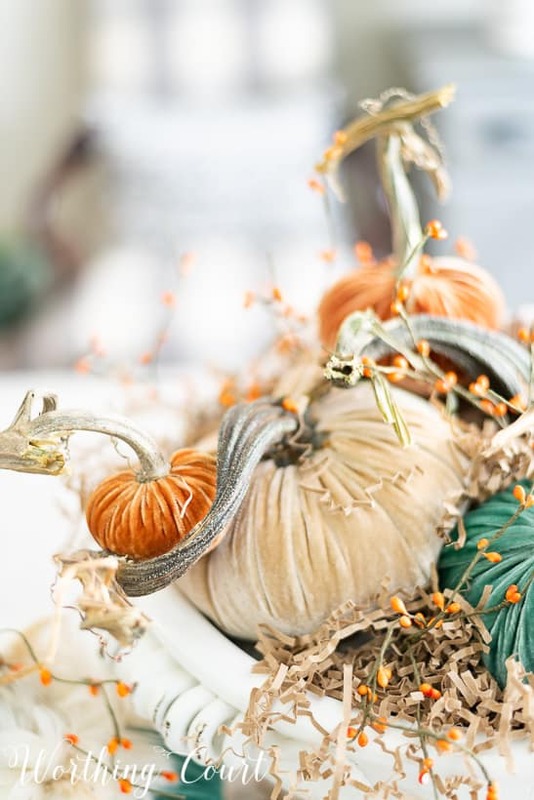 Every stem is a piece of art on its own and the curviness of them can become a great prop for displaying the pumpkins in a unique way. The largest pumpkin, which is sporting a collar of natural feathers, is so beautiful that it deserves to be in the spotlight by itself. Swoon! 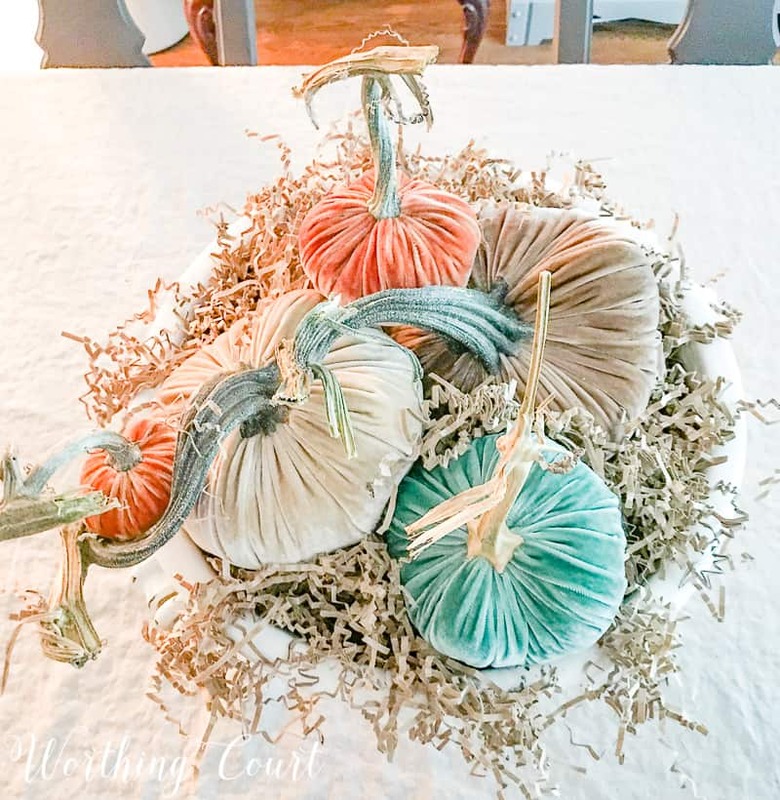 The pumpkins are available in a large assortment of colors and sizes and can be purchased individually or in groups. Creating an arrangement like this is so much easier than you think! Let me show you exactly how I put mine together and then you can adapt what I did to fit your own home and container. 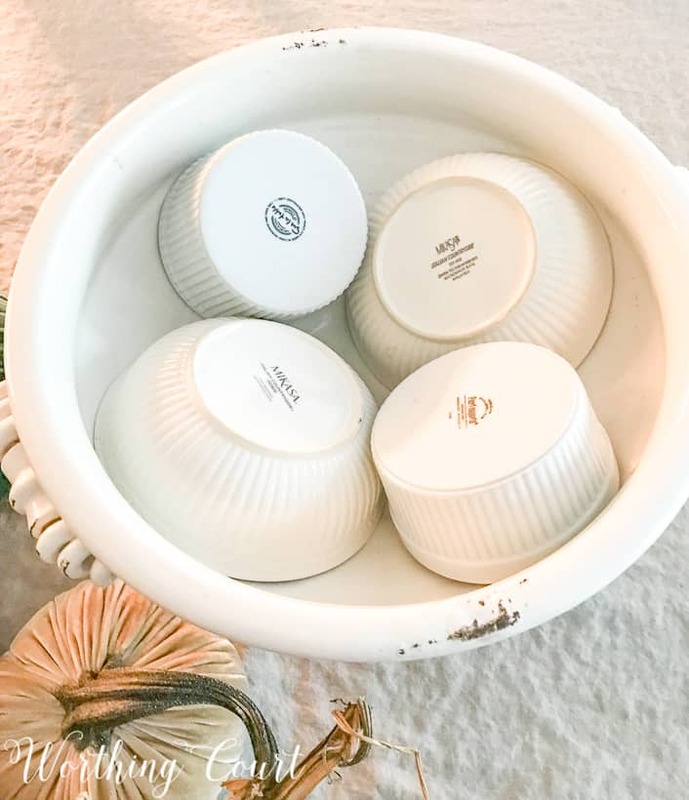 Hot Swash velvet pumpkins, large footed bowl (the opening of mine is 14″ across and the bowl is 9″ tall), assorted smaller bowls, shredded paper crinkles and berries. You can ignore the candle and candlestick in the photo – I wound up not using them. To make it appear that the container is overflowing with pumpkins, place filler in the bottom. I used a variety of bowls from my cabinets, turned upside down. Place the pumpkins on top of the bowls. Be sure to turn and tilt them at different angles instead of positioning them with all of the stems pointing straight up. Fill in the empty spots with shredded paper. The light bulb came on – thank you. Have a huge wine colored soup tureen that would be wonderful for an arrangement but never came up with a solution to raise the items I wanted to show off. Am grabbing some bowls today. Thank you for the sharing your secret. Glad you found some inspiration, Carol! Beautiful arrangement! You are so clever and talented. I enjoy your blog and your Instagram photos. Thank you. Thank you for being so sweet and encouraging! The use of crinkled paper as a filler is genius! I’ve used it for the inside bottoms of lanterns to create a soft looking base for whatever is displayed in them but never would have thought to use it as a filler. I love crinkled paper too. One of my favorite things about it is the way you can make it look like it’s kind of dripping over the edges of a container. I love the Hello Doormat. I need a new one and these look like good quality. Looks AMAZING! 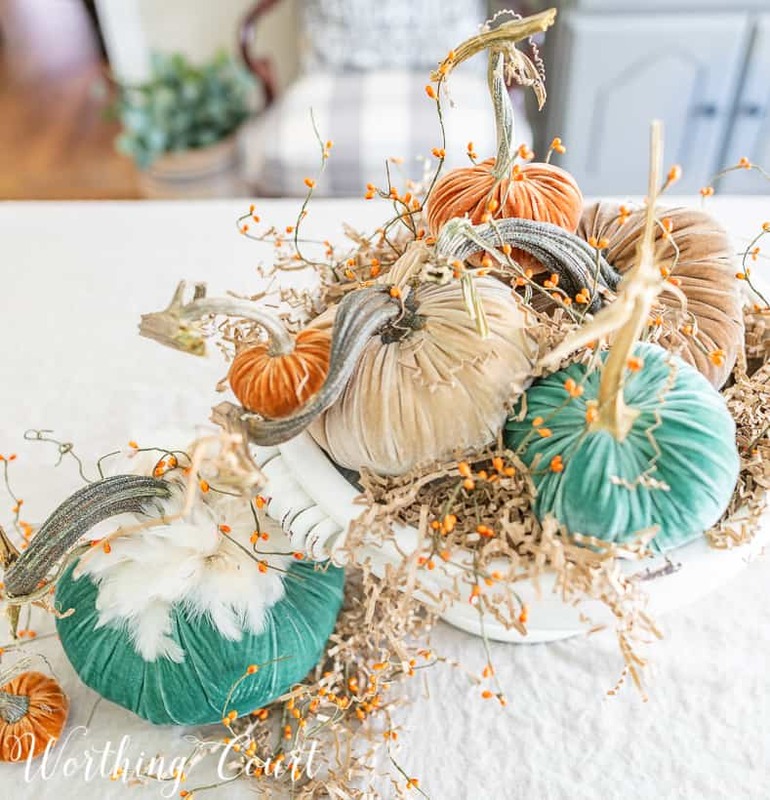 I have a similar soup tureen so you have just give me another great way to display the gorgeous pumpkins. Nice work! Glad you found some inspiration, Mary Ann! 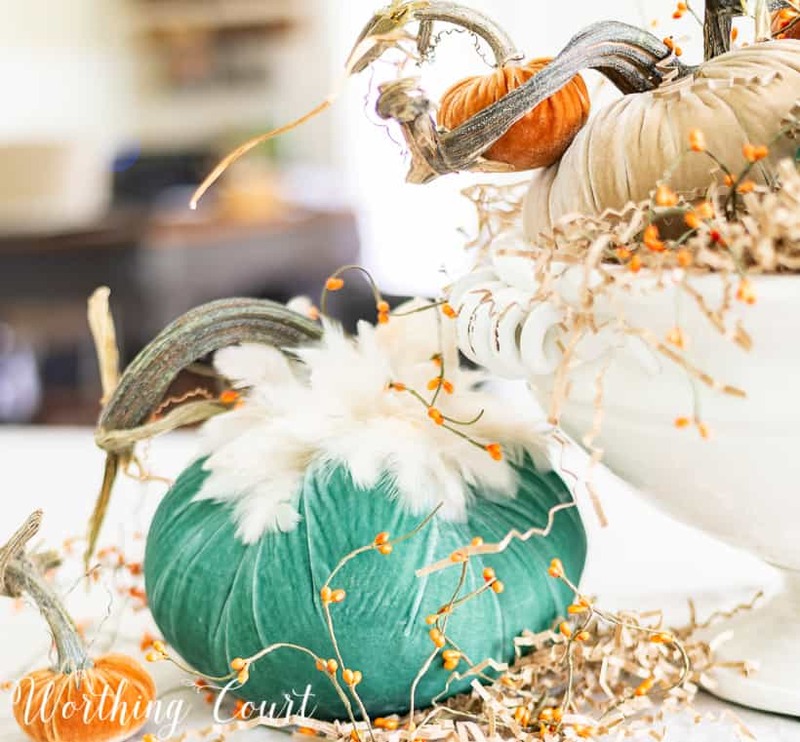 I love, love , love the feather touch on your velvet pumpkin! I wish you could reach into the screen and feel them – they’re soooo soft! You did an AMAZING job on your centerpiece, Suzy!!! Love the colors and the additional fall elements! Sigh!!!! It’s so great to see a new take on the typical “ole” pumpkins. These are beautiful! They truly are a work of art! This is beautiful! 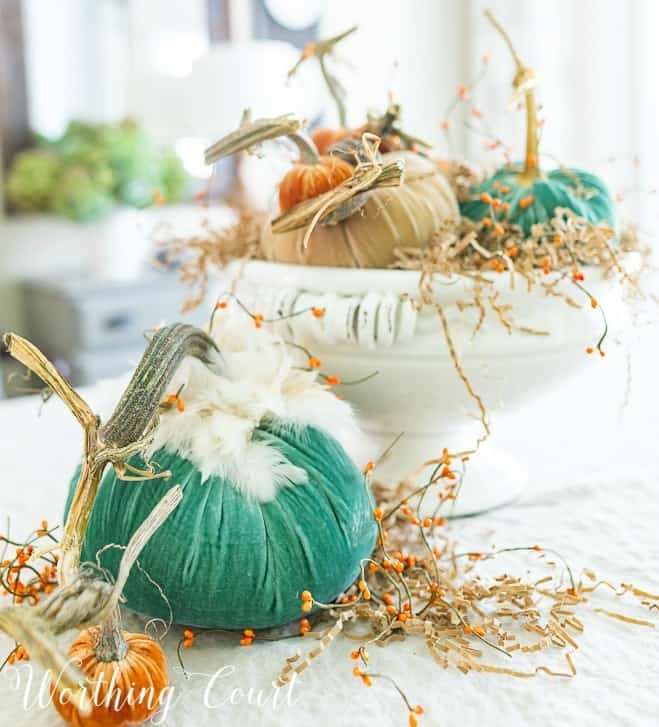 Love the velvet pumpkins, they’re gorgeous!! Thank you, Lindsay. Those pumpkins are to die for! Suzy, you’ve outdone yourself! 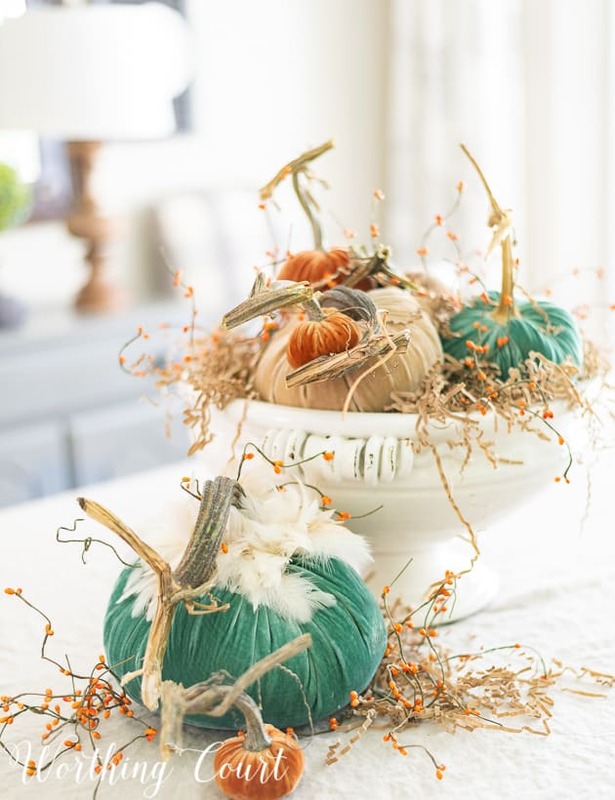 I love the idea of putting these adorable pumpkins in a soup tureen! Beautiful and easy! Love the pumpkins. Love the pumpkins. This would be a great win. I love everything in the shop. Thanks for the chance. Happy Fall. 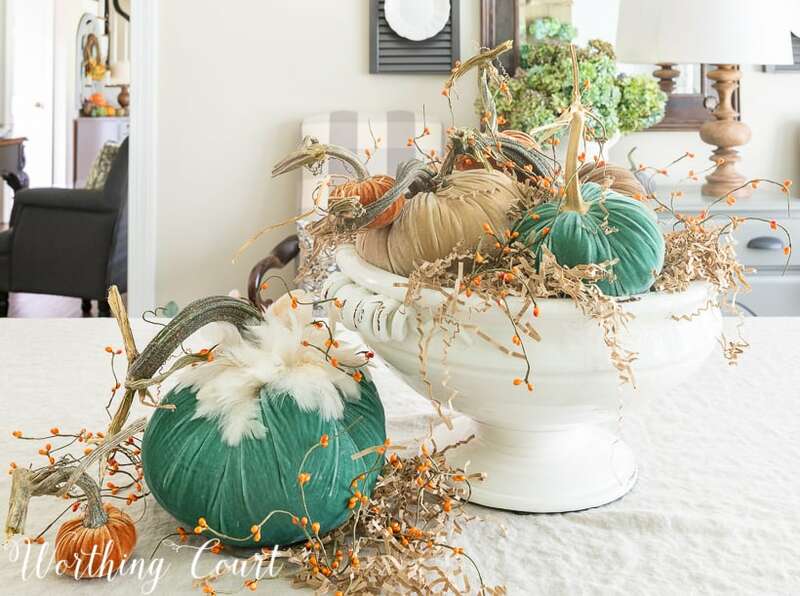 Love the pumpkin display on your dining room table. I have loved al of the bloggers using these amazing pumpkins. Each blogger has their own style shining through in the displays. Looking forward to seeing your whole “fall home” this year. 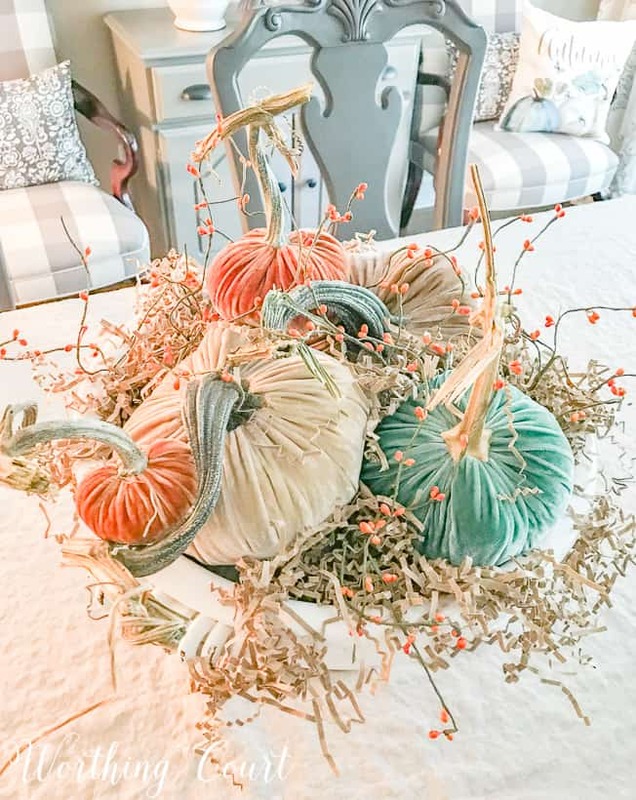 I have to tell you I was at Goodwill yesterday and came across one of these velvet pumpkins! Are you sitting down ? A $1.99 yes I grabbed it as quick as I could and purchased it ! Along with a wonderful fall table cloth for 4.99 ! I couldn’t believe someone had donated that velvet pumpkin! It is going to grace my coffee table this week! WOW! Thanks for telling me about your terrific score! Suzy, this is gorgeous! And I love how your shared your tips on filling that bowl, genius!